stylos: A brief examination of "The Great Controversy"
Image: Cover of "The Great Controversy" an Adventist book recently mass mailed throughout Central Virginia. I had two people this week bring me a copy of a book that has apparently been mass mailed throughout our area (one received the book in the mail in Louisa, the other had a friend in Scottsville who had also received the book in the mail). The paperback book with thin newsprint paper is titled The Great Controversy: Past ∙ Present ∙ Future: How Will It End? It has a colorful cover with a sunrise over planet earth and various chess pieces. What is the book about? Who sent it? Is it orthodox? Just looking at the book itself, we can make some initial observations. Though it has a price ($11.95) on the back cover, it has no ISBN number. The book is self-published by someone. The publisher is listed as Remnant Publications, Inc. and Project Restore, Inc. Both names indicate an interest in eschatology. The name of the author is not readily available. A search of the front pages finally yields the small print note, “Original text by E. G. White.” Now, we might ask: Who is E. G. White? Is this a man or woman? How has the text been expanded? The book has no copyright date. What about the content? Inside are 43 chapters that begin with a survey of history from the destruction of Jerusalem to the end of the world and pitches history as “the great controversy” between God and Satan. Early chapters focus on proto-Protestant (Waldenses, Huss) and Protestant heroes (Luther, Zwingli). One might initially think the book comes from a Reformed perspective. Then with chapter 18 we come to a description of “An American Reformer.” Now the fuzziness becomes clear. This chapter offers a glowing portrait of William Miller. Who is Miller (1782-1849)? He was a former Baptist preacher who became enmeshed in end times speculations and numerology, wrongly predicting the return of Christ on October 22, 1843. When October 23, 1843 arrived, the date became known as “The Great Disappointment.” In other words, Miller was the Harold Camping of his day. Unlike Camping, however, Miller and his follower resourcefully reinterpreted his false prediction by saying that though Christ had not physically returned to earth, there had been a spiritual event in heaven in which Christ had cleansed the “sanctuary.” Chapter 23 is “What is the Sanctuary?” From Miller’s ministry came the modern Seventh Day Adventist church. One of Miller’s followers was Ellen G. White (1827-1915), the author of the book in question, who began to have visions and served as a prolific writer and teacher in the early Adventist movement. Miller apparently wrote the book piecemeal from 1870-1884, and it has since been published in various edited forms. Further perusal of the book reveals a chapter upholding the Adventist view of Saturday as a perpetual Sabbath (chapter 25 “God’s Law Immutable”) and predictions of future persecution of Adventists (chapter 39 “The Time of Trouble”). 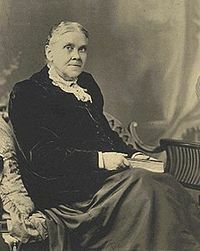 Image: Ellen G. White (1827-1915), early Adventist mystic and teacher who is the author of "The Great Controversy." Conclusion: The Great Controversy is an interpretation of history from a Seventh Day Adventist theological perspective (including a hagiographic presentation of Adventist founder William Miller and promotion of unorthodox Adventist beliefs like the 1843 cleansing of “the sanctuary” and the seventh day Sabbath), written by Ellen G. White, one of the early founders of the Adventist movement. It has apparently been mass mailed as an effort to convince recipients of the truth of Adventist doctrines. Some practical warnings: Beware of free books on religion that show up in the mail, particularly if they are self-published and do not seem immediately forthcoming about the authorship and religious perspective of the book. Beware, in particular, of books which promise definitively to answer questions about eschatology (the doctrine of last things). Hey, I want my free book! I had to purchase my last acquired book on Revelation and eschatology written by G. K. Beale (another obscure author name?) cost me $50. Miller died in 1849 years before the Great Controversy was written also Miller was not a founder of the Adventist Church. Quite right. He was a "forerunner" rather than "founder." The article simply says, "From Miller's ministry came the modern Seventh Day Adventist Church." Is this incorrect? I got the book... unsolicited!!! I live in Michigan and we just found this book left in our newspaper box on Nov 15th 2013. Someone is making sure it makes the circulation to everyone, paid or none paying customers. As a christian I will read through the book to see if it matches up with God's word. Then draw my conclusions from there. Thanks for the blog on this book. Thanks, but I'm good. One is plenty. you have expressed your thoughts .but please do it without making fun of what others believe. If everyone has "the power of choice" to "make up their own mind" then that must mean that I also have this "power" and thus can be free to evaluate the ideas and opinions put forward by others, including Ellen G. White. Just because I reject their teaching does not mean I "have something against them." You imply my disagreement is irrational or simply hateful. Also, where in this brief review do I "make fun" of what they believe? Have I misrepresented or distorted their views? If you can point this out I will correct it. Was this book not copied from 'The History of Protestantism' 1876?? Then claimed by Ellen G White that it was a revelation from God. Just got mine in Petaluma CA. Thanks for this post! I put my free copy to good use, the recycle bin! Sure out of sheer curiosity I looked it over and clearly understood the same blind faith, fear and hatred I have seen time and time again. I was raised by very loving religious christian family and spent a little too much time at church in my early years which was most like religions downfall for me since I was very smart, curious and asked too many questions. I quickly learned what it was all about and moved on to continuing my search for the truth. I have studied the bible, many other great religious works and many religions since and have only to come to one resolve: They were all conjured up in the human mind of man pure and simple. Some with better principles and writing that others but all non the less written by men inspired with delusions of god, heaven, hell and everything in between. So many wonderful minds focusing and wasting their mind power on this. With many truly believing in their works. Lots of good and lots sheer evil acts has come out of religion and religious beliefs. It time for man to grow up and break free from this misguided path which religion has placed so many of us on. You may well know that Ludwig Feuerbach argued long ago that religion is just projecting our longings for a Father figure upon the heavens. The problem, as I see it, however, with this argument with regard to the Christian faith is that so much in Biblical Christianity is not what we would project upon the heavens if it were merely a matter of our wish fulfillment. Examples: Love your enemies, deny yourself, take up your cross daily and follow me. It calls not for what we naturally want but for what we do not want: to die to ourselves and live to God through Christ. I urge you to give the NT, in particular, another reading and attend a traditional and theologically orthodox Christian church which focuses on teaching the Bible. Christianity is not an individual pursuit and you have not really studied it till you have done so in a community (church). I got my book in the mail today. I kind of thought it might be from the Seventh Day Adventists. Thank goodness for the internet. I put the name of the book in and got this information on it. I am curious and will read it a little. John and James told a preacher they didn't agree with to stop preaching in the Name of Jesus, because, they thought they were the only true preachers! But Jesus rebuked them. 'He who is with us is not against us', said Jesus. Jesus knows those who are true to Him. He hasn't sent warnings to us about Islam or the Satanist! Why should we take His role as the Arbiter of Doctrines and Corrector of Heretics? His advice to us was 'Judge not, that you may not be judged? For with the same measure you meat out, it will be measured to you.' Satan is the accuser of the brethren. He can use ministers to accomplish his purpose. 'Despise not prophesying, prove all things and hold fast to that which is good' is the counsel of God to His people. Leave that to Him! "Beloved, believe not every spirit, but try the spirits whether they are from God: because many false prophets are gone out into the world" (1 John 4:1; cf. 2 John 1:7, 9-11). We are called upon both to be discerning and to judge, just not to do so hypocritically (Matt 7:1) or uncharitably (Eph 4:15: "speaking the truth in love"). Though salvation is by grace through faith, this does not mean that the church is not necessary for the Christian. It is essential. Jesus established the church, not man (Matt 16:18). He commanded his disciples to love one another (John 13:34-35) and where is that lived out but in the church? Paul described each Christian as like a body part (1 Cor 12), which implies they are part of a body. Hebrews 10:25 warns against those who forsake assembling together. And how can you submit to your leaders (elders) if you are not part of a church (Heb 13:7, 17)? Christianity is not faith where you simply have your "personal" (private) faith. It is a common faith. A Baptist home on Maryland's Eastern Shore received the book. While I'm not certain that seventh day doctrine is sound, I am grateful and accept the gift in the spirit it was sent. This book, "The Great Controversy" in my view is a wonderful eye opener to anyone seeking the truth. The lays out some of the events in the history of the christian church and exposes nature of some systems that Satan uses to deceive the Saints. "Many ministers would not accept this saving message themselves, and those who would receive it, they hindered. " "The people see that they have been deluded. They accuse one another of having led them to destruction; but all unite in heaping their bitterest condemnation upon the ministers. Unfaithful pastors have prophesied smooth things; they have led their hearers to make void the law of God and to persecute those who would keep it holy. Now, in their despair, these teachers confess before the world their work of deception. The multitudes are filled with fury. "We are lost!" they cry, "and you are the cause of our ruin;" and they turn upon the false shepherds. The very ones that once admired them most will pronounce the most dreadful curses upon them. The very hands that once crowned them with laurels will be raised for their destruction. The swords which were to slay God's people are now employed to destroy their enemies. Everywhere there is strife and bloodshed." Jeff, I actually think you were respectful in your assertions. Thank you for that. However, as in the bible it says 'Prove all things' so it is worthwhile looking at what others believe just to see if it is right. I have looked at all kinds of beliefs in my pursuit of the truth and I think it is important to have an open mind to what others believe because it might be true. This is how I have found out a lot of things from the bible, by comparing other beliefs. The bible is the standard and everything has to be compared with it. It is an interesting strategy to accuse any who might criticize your views as being deluded and devious. The result is essentially an ad hominem attack on any critic. Let's stick to the content. What exactly in my review of the book is in error? I reject the book, because its content does not conform to sound Biblical interpretation (e.g., its view of a secret eschatological event in the 19th century, the "cleansing" of the temple, the seventh day sabbath, and even the fact that Ellen White presumed to be a doctrinal teacher [at variance with 2 Tim 2:12]). It simply is not orthodox. I'm sorry you had a rough experience growing up in religion. That is what the devil wants...to deceive and confuse. I am a follower of the bible sabbath. I was raised in the seventh day adventist church and I asked myself the same questions..is this true...and I studied...and it is TRUE. Everyone is certainly allowed to have their opinoin..but the truth IS the truth regardless . God is coming quickly. The devil doesn't want people to get close to God..so don't let the devil win. Yes the first step is a personal relationship with God. As one walks closer and closer they desire the truth. This book explains so many things on so many levels. God doesn't want us lukewarm. My friends be ready. God is so close to coming. May God carry you through your battles. Don't you think it might be a more honest approach to come out and say that this book reflects Seventh-Day Adventist teaching? Maybe even clearly state who the author is? I too have studied the Christian sabbath and am convinced it is Sunday, the day of Christ's resurrection. Just got "mine" in the mail in San Antonio, TX today (1 Jun 15). So glad for your post here as now I, too, can recycle it. There is only one book of Truth and that is the Bible. I love your final "warnings" at the end of your post about free books in the mail! Love your practical advice: "Beware of free books on religion that show up in the mail, particularly if they are self-published and do not seem immediately forthcoming about the authorship and religious perspective of the book. Beware, in particular, of books which promise definitively to answer questions about eschatology (the doctrine of last things)." Just got "mine" in the mail in San Antonio, TX today (1 Jun 15). So glad for your post here as now I, too, can recycle it. There is only one book of Truth and that is the Bible. Thanks for posting. Don't know who you are, "Pastor Jeff", but you are right on!! Any religion that doesn't believe that Jesus is God's son, who died for our sins, that we may be forgiven , because we ask Him into our heart and it is not of something we did….but because of Jesus' blood that was shed for us….& thus this book is not for me. This author doesn't believe this. 1. The appeal to your emotional experience (the book made me cry) is no proof of its veracity or authority. Romance novels can make people cry, but it does not mean they hold theological value. 2. The book that we should look to is not this one but the Bible. My point is that this book does not accurately interpret or handle the Word of God. Religion is the fundamental cause for hatred and war in this world. Believe or don't believe, it's a choice. My choice? Book in recycle bin. I just got this book in the mail, and quickly looked it up online. It is a said thing. Different groups saying different things. Feeding the hungry with possible poison. I just want to know the right way. I want to be sure I have a relationship with Christ. I can't understand the difference between; Baptists, Presbyterians, Methodists, and etc. Don't we all believe in Jesus Christ as our Lord and Savior? Isn't that the one important thing? Since I don't know what type if church to join, I haven't been baptised. The churches want you to join their church and then they will baptise you. In the bible, people were baptised then brought into church, with the emphasis on Christ. I remember being told I couldn't praise dance at this one church, because I was a member. Jesus' followers were welcomed at any church in any land. They would greet each other as family and always gave glory to God the Heavenly Father. All I know is, I am uncomfortable, I am confused, I am saddened, and I am untrusting of most churches. I don't feel that sense of community and family in Christ. My questions are not answered. I'm not sure where I stand with God, but he loves me and I feel love for him. I want to be cultivated and grow in Christ. I want assurance that my faith is real and not faked or misinformed. I want and need Jesus in my life. Have you not noticed that in my writing, I'm not even sure if it is right to believe that I c an call Jesus God? If Jesus was God in human form, why did Jesus pray to God? Why would Jesus continuously tell others things like "Why do you call me good? There is no one who is good, not one man. Not the Angels. Only God in Heaven is good." and when Jesus was asked how we should pray he saud "In this manner 'Our father who art in heaven....'"? How am I, a willing and wanting servant, suppose to serve God correctly when everyone has some different word or message ir argument? I just want to be with God. By virtue of your last paragraph you are not an orthodox Christian. To be that you must say as Thomas said to Jesus, "My Lord and my God" (John 20:28). You also need a faithful guide to help you understand how to interpret Scripture. When the Ethiopian was asked if he understood what he was reading, he replied, "How can I unless someone guides me?" Find a faithful minister in a faithful, orthodox church to teach you. Go to a Reformed Baptist or Reformed Presbyterian church (not a liberal, mainline church) with a teachable spirit and seek their counsel. When a claim is falsified in Science everybody agrees it is bogus; it’s discarded; it’s put into the trash bin of bad ideas. When a claim of religion is falsified it becomes a metaphor. Oh my gosh guys, just ask God, and then be ready to listen, the problem is many of us ask for the truth and then we don't listen to God answer us, or sometimes we do listen and then think that we are special because God does answer us. Since when does a parent not answer any question that a child asks of the parent. Ask God and then listen. Ask and you shall receive. She absolutely does too believe that! Can you give me any Biblical evidence for your belief? I find several places where I am instructed to keep the 7th day Sabbath holy, but I don't find a single place that authorizes me or instructs me to change the day from the 7th to the 1st. I understand the 1st day is being kept by tradition, but where has GOD given us instruction to make the change? I have read through your responses on this posts, and I commend you for defending the faith in the way that you do. It is very encouraging to see the Christian Faith defended using sound logic. I would like to hear more from you regarding how we are to minister to 7th Day Adventists. Do you have any literature? Thanks for the encouragement. I don't consider myself an expert on the Adventists. Other than this post, I have not written anything else on them. I think the best way to approach apologetics with Adventists is probably simply to have a firm grasp of orthodox theology. Pastor Jeff, if you don't know about Adventist beliefs, how can you claim the book to be error. I have read the book and found no disagreement with the Bible and history and the reformers conclusions that began with the reformation! In fact I understand it all so much better now! It seems the mainline Protestant churches have lost what they gained from the reformation. It's not about Adventists, it's about history and what's been forgotten. Nowhere in that book does it say Jesus is not the Son of God. In fact quite the opposite. In fact it says it is all about the controversy between Jesus and Satan, good and evil. That's why the name "The Great Controversy". I hope anyone would read it prayerfully and honestly! This is definitely an Adventist view of history. It does not offer an unbiased view of church history (including the Reformation) nor one that Reformed church historians would affirm. The book also presents some significant errors, as cited in the post (e.g., the 1843 "cleansing of the sanctuary"; Saturday as the Christian sabbath). Then there's the whole issue of this work being done by Ellen G. White who claimed personal revelations and mystical insights of the sort that undermine the sufficiency and authority of the Bible (not to mention ignoring Biblical prohibition against women as doctrinal teachers; cf. 1 Tim 2:12). BTW, someone in a previous post in this thread noted that White lifted much of the material in this book from another titled "History of Protestantism" by J. A. Wylie. You might do some googling of that book title and Ellen G. White and see what you come up with. If we want to honor Christ, we need to honor his word, including instructions like this from the apostle John: "Beloved, believe not every spirit, but try the spirits whether they are of God: because many false prophets are gone out into the world" (1 John 4:1). I enjoyed this book. You seemed to bash it though. What I read and what you posted seem very different. Googling this author led me to many different opinions so that would most likely not be a valid source...as anyone can post anything true or false. I thought a free book was a nice gesture. 1. You note that I "seem to bash the book." You also note that what you read in the book and how I described it "seem very different." Can you point to specific places in my description or analysis that were "bashing"? Can you point to specific examples of places where my reading or analysis was in error or unfair to the book's content. If you can do so (and can convince me you are right) I will gladly edit the post. 2. You note that googling led to "many different opinions" and conclude, "so that would most likely not be a valid source." I do not follow your logic here. There might be many opinions about various topics on the internet. Some might be false and some true. The fact that there are many opinions or that there are false opinions does not invalidate true or accurate opinions. Again, my challenge to you would be to show me the places where I make factual errors in this post. 3. You note the book is a "nice gesture." No doubt the folk who sent this were motivated by a sort of good intention in that they wished the recipients to read the book and embrace Adventist teaching. I am not questioning their motives but the fact that Adventist teachings swerve from Biblical orthodoxy. Finally, let me pose a question for you: Are you an Adventist or were you one before you read the book? If so, is it possible that you resonated with the book primarily because it agreed with what you already believe. My challenge is whether or not those beliefs are reliable and faithful to orthodoxy. What is your biblical evidence for Sunday worship that is so compelling? 1. Jesus was raised from the dead and the church first assembled on the first day of the week (cf. John 20:1, 19). 2. Paul stayed seven days in Troas, but the church there did not gather for worship till the first day of the week (Acts 20:6-7). 3. Paul exhorts the church at Corinth to collect an offering when they gather on the first day of the week (1 Corinthians 16:1-2). 4. Jesus is Lord of the Sabbath and has the sovereignty to transfer the Sabbath from Saturday to Sunday in the new covenant (Mark 2:28). Got the book in the mail unsolicited on 4/26/2016. Never heard of it, but thanks for this blog. I may read parts of it, but I'm pretty sure its theology is not for me. I'm just a main stream Protestant (Presbyterian) and very secure and comfortable with that as a guidepost. While many wonderful events in the Bible occurred on certain days of the week, there is no direct command from God to keep them holy. For instance, Jesus died for our sins on a Friday. That is arguably the most significant event in all of history, marking the moment our death sentence was commuted and our opportunity for salvation assured. But not even one Bible text hints that we should observe this day of such great significance. However, there is indeed a memorial of the resurrection commanded in the Bible, but it is not keeping Sunday holy. Instead, the apostle Paul wrote, “We were buried with Him through baptism into death, that just as Christ was raised from the dead by the glory of the Father, even so we also should walk in newness of life” (Romans 6:4). Baptism is the memorial of Christ’s death, burial, and resurrection. Some teach that Christ’s disciples met in the upper room on the Sunday He was raised to celebrate the resurrection. But the Bible record shows very different circumstances. Luke tells us that when confronted with eyewitness accounts of His resurrection, they “did not believe them” (Luke 24:11). And Mark records, “After that, He appeared in another form to two of them as they walked and went into the country. And they went and told it to the rest, but they did not believe them either. Later He appeared to the eleven as they sat at the table; and He rebuked their unbelief and hardness of heart, because they did not believe those who had seen Him after He had risen" (Mark 16:12–14, emphasis added). If none of those upper room disciples believed that Christ had risen, they could not have been joyously celebrating the resurrection! John explains their reason for being together in these words: “The doors were shut where the disciples were assembled, for fear of the Jews” (John 20:19). It is true that Jesus was raised on the first day of the week, Sunday. What a dramatic moment and so vital to our salvation! However, not one instance of Sunday observance has been found in Scripture. And there is no biblical evidence—clear teaching or even an intimation—that we should keep that day holy. The basis for keeping the seventh-day Sabbath remains the direct command of God (Exodus 20:8–11; Deuteronomy 5:12–15). everyone loves to talk about the end times, and yet not many christians rememberthat jesus believed in peace, helping the masses he also gave us this planet that were destroying.for 2000 plus years people have been preding the end times. i think will choose that time, not man. we should all strive to be more like jesus everyday instead of hoping for the end of times. Thank you for the time you put into reading and explaining what this book is about. I found your article to be to the point, matter of fact with regard to your findings. I read no dis-respect or ridicule, nor even a tone of dis-respect. The things you mentioned, about the missing ISBN, vagueness of the author's name, etc were definitely a red flag. I am putting the one we received (unsolicited) in the trash. Hmm? Just curious, Have you studied those points you mentioned prayerful yourself from the SDA perspective? Just you in the Lord? Maybe God sent you the book and wants to show you something? Just a side note. From my dialogue with many denominations lay people pastor etc.. none really have a good handle on the Bible like SOME Adventist do. Not all, but some. Especially when it comes to end time events, bible prophecy, life after death, the Sanctuary etc. The SDA understanding to me makes scense.They follow history and Jesus' work in the Sanctuary above. I don't understand why some Ministers call thier doctrines heresy. The Sanctuary message no other church has and it's a beautiful message on the plan of salvation. A book you might want to get on this topic, is called: "Ransom and Reuion" by W.D Frazee. Need to provide a direct command. None of the verses presented establish Sunday sacredness or any transfer. The papacy (anti Christ system) did the transfer from the Bible Sabbath ( Saturday) to Sunday the first day of the week. This book has some historical correctness, but much is in error, especially when it comes to doctrine. It is the epitome of the philosophies of men (vs true doctrine as taught by authorized servants, true apostles and prophets) interlaced with scripture. Without understanding pure doctrine, it may sound correct. Ozius, are you saying that this book is "inerrant" in what it says concerning Biblical doctrine? That is an unorthodox claim. The only infallible work is Scripture itself. This work is uninspired and IMHO filled with error. If every criticism of the book is claimed to be from the devil, then you will accept no criticism of it. I'd encourage you to be open-minded and honestly, fairly listen to the critiques that have been offered of the book, both here and elsewhere. You should have nothing to fear from a reasonable examination of any book.